Football Fans in Training is a hugely successful lifestyle programme aimed at men aged 35 – 65 years old with a waist size of 38 inches or more. Delivered at professional clubs, by professional clubs, participants get the chance to learn about diet & nutrition, healthy lifestyle choices and take part in the gentle physical activity. Each of the scheduled WWSET FFIT programmes will run one evening a week for 12 weeks at Adams Park, with participants building up their ability to take part in some football-related activity. 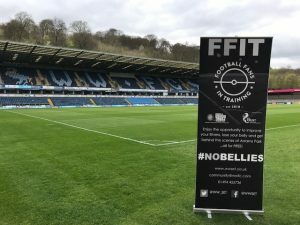 Whilst improving the health and wellbeing of our fans, the FFIT programme will also provide a behind-the-scenes look at Wycombe Wanderers FC. The FREE weekly sessions are split between education based workshops and physical activity training with all sessions delivered by WWSET’s professional coaches. Participants will also receive a free WWFC top and jogging bottoms each. To sign up for the WWSET FFIT programme all you have to do is meet the criteria below. It’s a great opportunity to improve your fitness, lose weight, and train with fellow supporters at Adams Park but places are limited so don’t delay…get in touch with us to reserve your place! 17th January – 11th April 2018 – Book Now!